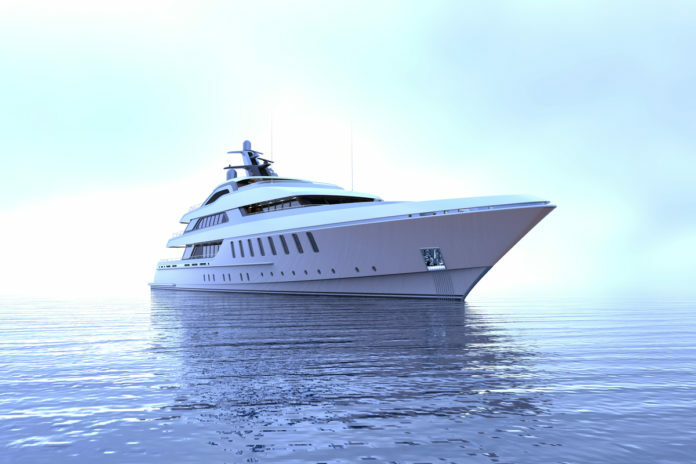 Nick Mezas Yacht Design unveiled its 69-metre Smooth, a new motor yacht project developed in partnership with Van Oossanen Naval Architects. Designed to be a fast and comfortable long-cruising vessel, the steel-hulled Smooth features Van Oossanen’s Fast Displacement Hull with integrated Hull Vane®, which allow for a high top speed and excellent fuel efficiency, with the Hull Vane® dampening the pitching and rolling motions of the vessel. Her exterior design boasts fluent line drawing a modern and yet timeless looking yacht. The main deck is dedicated to the full-beam Master’s suite, with private office, a spacious bathroom, a large walk-in wardrobe and a private cinema. Large windows allow for plenty of natural light in. The main deck hosts the main saloon and dining area, located aft, which offer seating for up to 12 guests. Right outside the saloon, a lounge area with a pool offer amazing views to enjoy. There is an extensive galley with pantry on the main deck’s portside. The tender garage is also located on the main deck and offers enough space for a 27-feet tender, diving gear, Sea-Doos, canoes and other water toys. Guests are accommodated on the lower-deck, across 4 cabins – two twin and two doubles. 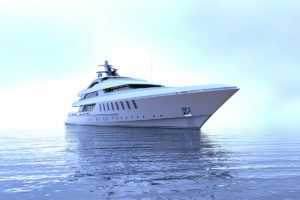 The crew quarter is located forward and includes 7 double cabins. The lower deck features a generous beach club aft with a portside terrace where to enjoy a swim, water sports or lounge. On the bridge deck, a second spacious saloon can be found, flooded by natural light through its panoramic windows. A gym is located forward of the saloon, followed by the wheelhouse and captain’s cabin. There is also a comfortable al-fresco seating area. The sun-deck features a Jacuzzi and a sunbathing area facing forward, equipped with a dance floor, another sunbathing area and a large bar. The yacht can travel at a top speed of about 20 knots, with a 5000 nm range at 14 knots, when powered by 2x MTU 16V 4000 M73L engines using a fully conventional drive train. Fuel consumption at 14 knots is about 28 l/nm (392 litres per hour). In good weather conditions, Smooth can cross the Atlantic from Gibraltar to Antigua in under a week.